I have not agreed with most of the changes that the administration has implemented since I enrolled at the College, and I have written more than a few opinion columns expressing my grievances. The College’s recent decision to stop accepting hard-earned Advanced Placement credits, for instance, would have greatly tainted my willingness to attend Dartmouth, as would the hard alcohol ban as I truly believe prohibition does not solve and perhaps even exacerbates the very issues it is meant to address. Dartmouth’s perpetually rising price tag is likewise frustrating. That being said, if I had to do it all over again, I would still choose Dartmouth. Before coming to Dartmouth, I had never had the opportunity to travel outside of the United States, and not for a lack of willingness or desire. Since enrolling at Dartmouth, however, I have been able to travel to many parts of the world — including Tokyo, London, Paris, Amsterdam and Rome — and none of this would have been possible had I not been a Dartmouth student. For all its flaws, Dartmouth offers a wide range of opportunities for students to explore their interests, whatever — and wherever — they may be, and the D-Plan ensures that Dartmouth students can take advantage of these opportunities more than their peers at semester-system schools. For all the changes it has undergone this past year, Dartmouth is still fundamentally the school I fell in love with and chose to enroll at, with its beautiful campus, welcoming student body, comprehensive academic experience and diverse study-abroad and internship opportunities. I hope the lucky students receiving acceptance letters today will be able to see that, too. Maybe it’s because I’m a ’19. Maybe it’s because I came in during the midst of the “Moving Dartmouth Forward” policy initiative. Maybe I just don’t have a point of reference. 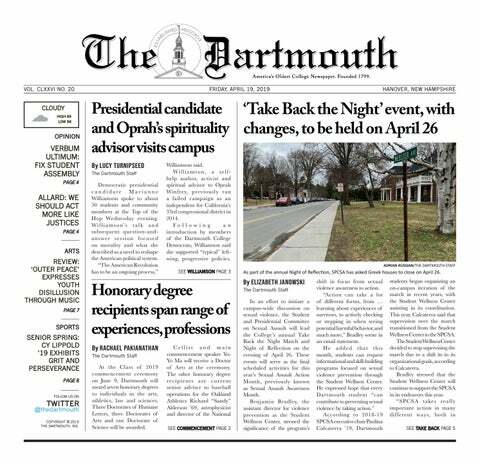 But I don’t think “Moving Dartmouth Forward” has altered any of the fundamental reasons I came to Dartmouth. A good amount has changed on the surface, but how much of that do prospective students even know about, much less understand? Does a visiting student understand student-administration tensions? Do they really care about the specifics of when third party bartenders are or are not needed? Even the house communities are polling well with prospective students. So, if I had the chance, I’d do it all again. I am getting kind of tired of the whole “Dartmouth’s going down the drain” narrative. Those who I hear it from are always the least interested in doing anything about this narrative. Frankly, I don’t believe it either. Interested ’20s have it right. They’re coming to learn from some of the best professors in the country, to have a good time while doing it and to find something worthwhile and interesting to do with their life. Dartmouth is doing a lot of soul-searching, but its heart remains in the right place. In spite of the many changes that Dartmouth has undergone since I matriculated, I would still — without a single doubt in my mind — enroll at Dartmouth if I were a member of the Class of 2020. I have had multiple friends from back home in Texas visit, and all have said the same thing: Dartmouth is really, truly different. To me, it is different in all of the best ways. Dartmouth is Hanover, in most respects, and our rural location — often decried by students looking for more excitement and social options — forges strong bonds with classmates and a deep engagement with the community. That same small community encourages strong student-faculty interaction, fostering relationships with professors in ways that large universities simply cannot provide. The fact that we recognize most people we see around town and campus, that we have social spaces theoretically (the Greek system, like much of Dartmouth, is not accessible to disabled-bodies) accessible to all of campus, creates a sense of camaraderie that has defined my college experience. Dartmouth undoubtedly has issues that deserve attention, but we also have a student body that is dedicated to addressing those issues. Though it understandably may not seem like it to many students, trust me — looking at the experience of many of my friends around the country, it could be much, much worse. We are blessed with a small school and a strong community, which forces administrators to listen to us and validate our concerns in a way unheard of at most schools. The frustrations felt by many students I have spoken with are real and valid, but looking at other universities of all sizes, it cannot be argued that the administration here does not at least try — even if ineffectually and superficially — to listen to the student body’s concerns. I have had my fair share of good times and bad times at Dartmouth. But my time here has provided me with a network of close friends and supportive role models, people I want at my wedding and faculty members who are genuinely invested in my future success. I feel connected to this space in a way that the rest of my friends from high school simply do not with their universities. Dartmouth is special. It has changed my life, and I would not have it any other way — I could not imagine it any other way.